After 25 years, the acclaimed, beloved Goosebumps series is obviously nothing to shiver at. Over 400 million books in print. Translated into 35 languages. Countless haunts, spooks, thrills, and laughs, for millions of kids and adults alike, which has made R.L. Stine one of the bestselling children’s authors in history. Plus, the series’ fan base keeps growing, and the critical raves continue. And now, on the heels of a hit Goosebumps movie that opened at #1 and took in more than $150 million worldwide, the eagerly awaited, delightfully frightful sequel Goosebumps 2: Haunted Halloween is ready to hit the big screen just in time for Halloween, offering up a trick-filled movie treat for audiences of all ages. 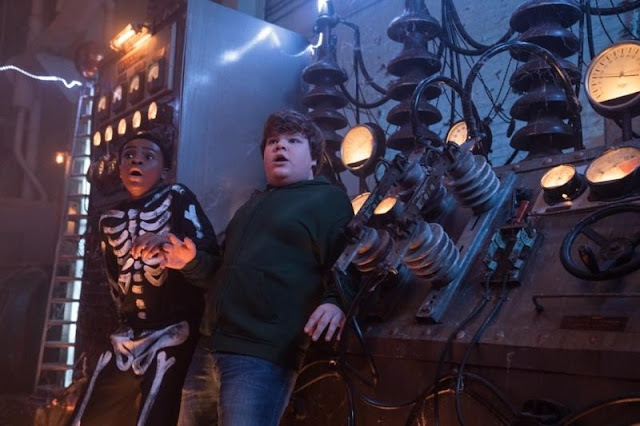 Goosebumps 2: Haunted Halloween follows the Quinn family – high school senior SARAH (Madison Iseman), her middle school brother SONNY (Jeremy Ray Taylor), and their mother KATHY (Wendi McLendon-Covey) -- into an entirely new set of spooky, exciting, and funny events. Sonny and schoolmate SAM (Caleel Harris) are best friends with a side job as the “Junk Brothers,” collecting discarded stuff other people don’t want. But it’s a gig that unfortunately leads them right into the path of (gulp) SLAPPY (Avery Lee Jones), the mischievous ventriloquist dummy from an unpublished Goosebumps book. At first, Slappy seems to want nothing more than to be part of the Quinn family, but when his hijinks go too far, Sarah, Sonny and Sam realize that this pernicious puppet must be stopped. Rejected in his obsessive need to be a member of the Quinn household, Slappy decides to build his own “family” by kidnapping Kathy and bringing all of his Halloween friends back to life - including new right-hand Ogre WALTER (Chris Parnell). As Halloween transforms their sleepy town into a full-on monster mash-up, boasting such hilariously freaky creatures as giant gummy bears and creepy garden gnomes, Sarah, the boys, and neighbor MR. CHU (Ken Jeong) team up to save Kathy and the town from Slappy’s wicked plan. Directed by Ari Sandel, the screenplay by Rob Lieber. Story by Rob Lieber and Darren Lemke. Based on The Goosebumps Books written by R.L. Stine. In Philippine cinemas October 31, Goosebumps 2: Haunted Halloween is distributed in the Philippines by Columbia Pictures, local office of Sony Pictures Releasing International.